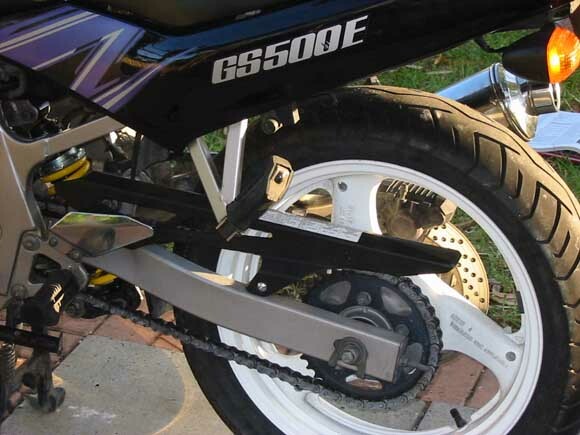 The SV650 chainguard directly bolts on in place of the stock GS chainguard and is much more attractive. This also opens up the possibilities of aftermarket carbon fiber/aluminum/etc. chainguards intended for the SV. Installing a rear hugger (and removing the chainguard) is a common upgrade by SV riders so these chainguards are easily found. Check ebay or the classified section of www.svrider.com . You can browse the classifieds or post a 'part wanted' classified there without being a member and at no cost. Note the shock in picture above is from an SV also. A direct bolt in as well, raising the rear ~2". It's attractive with it's (stock) yellow coil but it's performance advantage over the GS' shock is unknown. Special thanks to Lee McDonald from GSTwins.com for submitting this.